Two extra benchmark tests examine the drive's behaviour when copying a few big files, a lot of small files and a mixture of file sizes by using cached copy functions of your OS as well as reading/writing data depending on the data's compressibility. 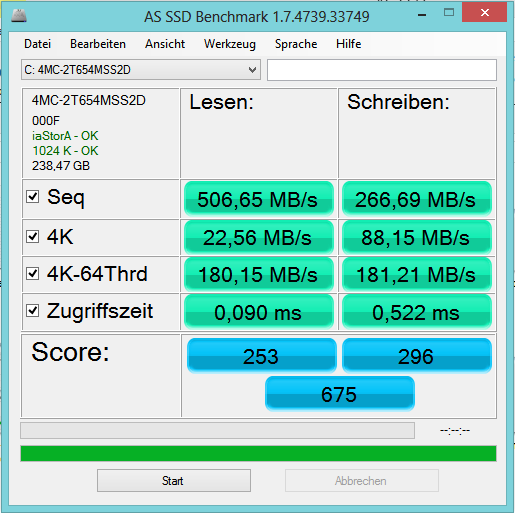 The synthetic tests determine the sequential and random read and write performance of the SSD. These tests are carried out without using the operating system cache. In Seq-test the program measures how long it takes to read a 1 GB file to write respectively. 4K test the read and write performance is determined at random 4K blocks. The 4K-64 corresponds to the test Thrd 4K procedure except that the read and write operations are distributed to 64 threads. This test should SSDs pose with Native Command Queuing (NCQ), differences between the IDE operation mode where NCQ is not supported, and the AHCI mode. The additional compression test can measure the power of the SSD in response to compressibility of the data. This is especially for the controllers that use to increase the performance and life of the cell compression, important. In the first three synthetic tests and the compression test, the size of the test file 1 GB. Finally the access time of the SSD is calculated, wherein the access to read over the entire capacity of the SSD (Full Stroke) is determined. The write access test, however, is done with a 1 GB big test file.